Our Level 5 Diploma in Occupational Health and Safety Practice is accredited by Occupational Awards Limited and recognised by IOSH. The qualification is based upon approved National Occupational Standards (NOS). 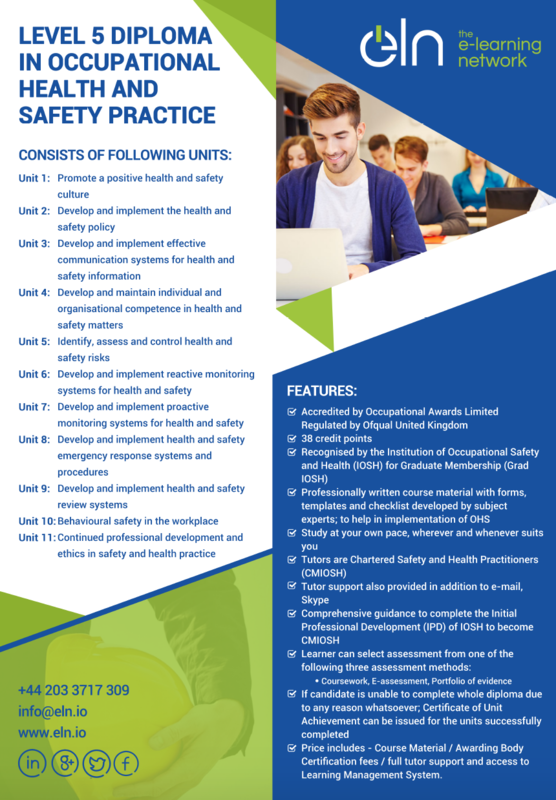 You do not need any previous qualifications in Health and Safety in order to do our L5 Diploma in Occupational Helath & Safety course, although you will need to demonstrate competence in job-related skills in your particular area of work and expertise. This simply means that you will need to be working as a health and safety officer in your workplace. Alternatively, you could ask your employer to give you voluntary/part-time access as H&S Officer so you can complete the practical requirements for this Level 5 Diploma in Health & Safety. If you do have any prior learning, please contact us NOW via webchat, email (info@eln.io) or phone (02033717309). The Level 5 Diploma in Occupational Health and Safety Practice is mostly delivered completely online and is assessed online as well through typed assignments and work-based evidence. Our qualified, subject expert, personal tutor will be available to you throughout your studies to assess and support you and help you complete your Diploma in H&S. We do offer group discounts and classroom-based courses (for groups of 5+), contact us right now on the live web chat below or email info@eln.io to get a quotation. 100% online and self-paced - qualify for IOSH Graduate Membership at your own pace! For more details about this qualification, click on the tabs above or contact us via our webchat, email or phone. We're waiting to help you ASAP! Core skills: There are no formal entry requirements for this training course however candidates must have suitbale reading and writing skills in order to complete the Level 5 Diploma. Learners are required to achieve all learning outcomes within units of assessment.